Goodreads says, "In the summer of 1951, Miranda Schuyler arrives on elite, secretive Winthrop Island in Long Island Sound as a naive eighteen year old, still reeling from the loss of her father in the Second World War. Although a graduate of the exclusive Foxcroft Academy in Virginia, Miranda has always lived on the margins of high society. When her beautiful mother marries Hugh Fisher, whose summer house on Winthrop overlooks the famous lighthouse, Miranda is catapulted into a heady new world of pedigrees and cocktails, status and swimming pools. Isobel Fisher, Miranda’s new stepsister—all long legs and world-weary bravado, engaged to a wealthy Island scion—is eager to draw Miranda into the arcane customs of Winthrop society. But beneath the Island’s patrician surface, there are really two clans--the summer families with their steadfast ways and quiet obsessions, and the working class of Portuguese fishermen and domestic workers who earn their living on the water and in the laundries of the summer houses. Uneasy among Isobel's privileged friends, Miranda finds herself drawn to Joseph Vargas, whose father keeps the lighthouse with his mysterious wife. In summer, Joseph helps his father in the lobster boats, but in the autumn he returns to Brown University, where he's determined to make something of himself. Since childhood, Joseph has enjoyed an intense, complex friendship with Isobel Fisher, and has a catastrophe that will shatter Winthrop’s hard-won tranquility and banish Miranda from the Island for nearly two decades. Now, in the summer of 1969, Miranda returns at last, as a renowned Shakespearean actress hiding a terrible heartbreak. On its surface, the Island remains the same--determined to keep the outside world from its shores, fiercely loyal to those who belong. But the formerly powerful Fisher family is a shadow of itself, and Joseph Vargas has recently escaped the prison where he was incarcerated for the murder of Miranda’s stepfather eighteen years earlier. What’s more, Miranda herself is no longer a naive teenager, and she begins a fierce, inexorable quest for justice to the man she once loved . . . even if it means uncovering every last one of the secrets that bind together the families of Winthrop Island." Miranda Schuyler arrives on the exclusive Winthrop Island in Long Island for her mother's wedding to Hugh Fisher, one of the wealthiest men on the island. Miranda is only eighteen years old and isn't accustomed to this lifestyle or the people, but she slowly finds herself acclimating since her stepsister, Isobel, takes her under her wing. While on the island, she comes to realize there are the wealthy families who summer there and then there are the locals. Through Isobel, she meets Joseph Vargas, a college student, who is home for the summer helping out his father. with his fishing boat There's an instant attraction between Joseph and Miranda, but Miranda knows her mother would never approve of her marrying a "local" boy and a fisherman's son despite his enrollment at Brown University. But everything is turned upside down when there is a murder on the island and Joseph pleads guilty, but Miranda knows deep down that he didn't commit the crime. So who did? Fast forward to the summer of 1969 and Miranda returns back to the island much older and with major problems of her own, but first, will the unanswered questions surrounding the murder finally be answered? The Summer Wives by Beatriz Williams is an atmospheric beach read that kept me glued to the pages and completely entertained. Miranda is such an interesting character in The Summer Wives. I loved her back story and then enjoyed getting to know her as the years went by; she had changed so much since she was the naive eighteen year old girl who first stepped foot onto the island. For starters, she has become a successful actress and has married a director, but things aren't exactly perfect between them. The one thing that Williams does so brilliantly is her character building. All of the characters in The Summer Wives are so interesting and complex. You feel like you know them well by the time you turn the last page. Williams also is one of the best historical authors who can truly bring the time period to life and she did that beautifully in The Summer Wives. I felt like I was living it alongside of Miranda . It's almost like I was watching one of my favorite classic movies like The Philadelphia Story. The class structure, the elaborate parties, the clubhouse, the etiquette, the secrets, the cocktails, and the beautiful coastal setting were all simply phenomenal. It all felt very real. Also, as I mentioned before in The Summer Wives, Williams incorporates a bit of a murder mystery and I was worried it would be too dark of a beach read for me, but that wasn't the case. I thoroughly enjoyed that aspect of the book and it will be sure to keep readers guessing. 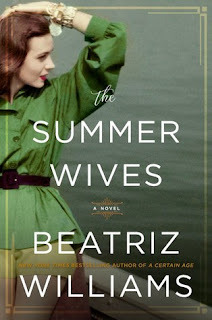 So, if you love historical beach reads with a gorgeous coastal setting, a bit of a mystery, some romance and a side of plot twists, you must check out The Summer Wives. It's one of my favorite beach reads of the summer. Great review!! I can't wait for this one. I always feel so immersed in her books, and I agree that her character development is wonderful. I'm glad you agree, Angela. I hope you enjoy this one. Thanks for visiting!